A simple design offering stunning quality and creativity across an uncommon range of applications. The sheer range of high quality compression. Easy and inspiring to use. Delicious on the mix-buss. A hefty beast that eats up the rack space. The Phoenix: simple but effective. The Phoenix is a bit of a rack hogger. The Phoenix has been around for some years now and has found a home in studios worldwide, but as with much of the Thermionic Culture range, it has been refined to meet the needs and wants of its users. This edition takes the previous sidechain model, which fitted a two stage bass cut filter to the sidechain detector circuits, and adds a standby switch and indicator light. This may not seem an extra feature worthy of fanfare, but it is useful and also gives an opportunity to reassess the qualities of this well-loved vari-mu compressor. "A bit of extra life in the valves and large reservoir caps goes a long way." First, what's with the standby switch? With the main power on, the standby mode holds the HT current (HT = High Tension, essentially high voltage) to the valve plates (anodes) at just under half its operational value. This effectively halves wear on the valves and HT capacitors as the user can leave the unit on (you don't just turn this kind of gear on and off at your whim - it needs warming up) all day and switch it to half power during breaks and the like. Considering the hours these kinds of units see from year to year, a bit of extra life in the valves and large reservoir caps goes a long way. As the massive white gain reduction meters measure current through the input/compression valves, they sit at 'half-mast' (just under 6dB) when in standby mode. Between the meters is one more recent enhancement: there are now two meter zero adjustment holes. The Phoenix ships with a specific tool for the task, looking like a thin biro bearing the meter manufacturer's name, Bourns. This enables the user to set the needle at 0dB once powered and warmed up, as this can drift over time. 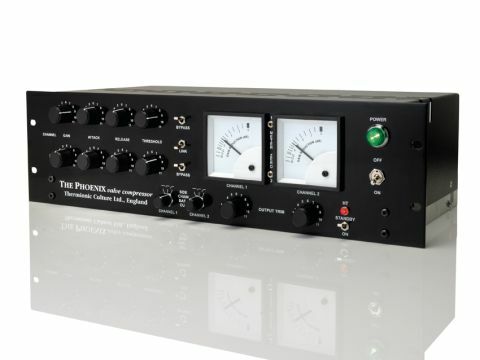 The Phoenix is a bit of a rack hogger, taking up 3U with its classic Thermionic Culture gloss black finish. The controls are simple, well spaced and have the feel of quality one expects for £3.5k. The two channels each feature input gain, attack, release, threshold and output trim pots with toggle switches for bypass and channel linkage, and two rotary switches for the sidechain bass cut filters. As this is a soft-knee or vari-mu design there is no ratio control, so the main action happens with the balance of input gain and threshold, using the output trim to compensate for the gain reduction, and boy can this unit munch a lot of level! The sidechain bass cut has two active settings: 150Hz and 300Hz. Not only do these allow smooth compression on bass-heavy sources and mid-focused control of vocals and guitars, but when the channels are linked they enable an averaging of the summed low end producing a third frequency (225Hz) when the first and second positions are selected on the two bass cuts. This adds flexibility with sub-group and mix-buss compression. From the first time the Phoenix is taken out of standby, one discovers two dominating characteristics: it is very easy to use and it sounds superb. Many compressors and limiters have a range within which they excel, but outside of this you'll be looking for a different unit. This isn't so with the Phoenix: it may not bite as fast and hard as many solid state VCA designs, but can still deliver rock-solid punch and brutal transients without flinching, while on the other hand out-smoothing most optical comps. The Phoenix pulls off the rare feat of providing exacting control in tracking and mixing roles, as well as oodles of creative possibilities. The quality of signal path is evident when you reach extremes of gain reduction ( 20dB) and find surprisingly little distortion. This is a compressor that you squeeze until, as Robert Plant delicately put it, the juice runs down your leg! Once aware of how far the Phoenix can compress without breaking up, any knob-shyness evaporates, and some heavy-handed explorations soon open up the dynamic possibilities. The input gain can be used to drive the distortion up, thickening and sweetening the signal; transient material can benefit from a wedge of this effect, taming the bite while still being able to rock a fast attack. Effortless dynamic control can quickly bring a source forward without losing clarity and yet there is still further to go. Drums can sound stellar, whether big roomy acoustic kits or punchy electros. The attack and release controls feel much more creative than on many compressors, facilitating greater musical manipulation. The bass cut filters really make a difference and produce very controlled, yet full sounding basses. The vari-mu characteristic enables such transparent control that keeping signals under the clipping point of A/Ds is easy while getting a pumped up sound that doesn't lose transient detail: pure class. Nothing sounded bad through the Phoenix, but its buss compression ices the cake. According to the meter we often strayed into ranges we're usually uncomfortable with (above 3dB on a mix), yet we lost nothing in punch, detail or stereo image. Pulling back the attack, stepping up the bass cut and altering the input gain/threshold balance brings back the life when things have got too cluttered. We could leave this on my mix-buss permanently - the hard-wired bypass switching means you can, even with the power off. With the threshold and input gain pushed right up, some juicy harmonic distortion thickens the tone with the GR meter needle hardly moving - simple and magic. As with all Thermionic Culture gear the Phoenix is hand wired and uses the very finest components (Mullard and Siemens valves and custom Sowter transformers). This build quality, allied to its remarkable sonic characteristics, fully justifies the price tag. There's nothing cheaper that does as good a job - really there isn't. There are few vari-mu compressors available, especially at this price, and yet the characteristics this topology affords are as useful and essential as they are creative and inspiring. We have been in studios equipped with the Phoenix (without the sidechain and standby functions), but this is the first time we've really got to sit down and explore it.